The Odysseia: Piano Concerts and Enthusiastic Droners; or, Must You Sing Along? Piano Concerts and Enthusiastic Droners; or, Must You Sing Along? Yesterday evening we went to a concert. It was Wednesday, which marks the beginning of our weekend. I’m still getting used to a Thursday and Friday weekend – and to a completely different calendar. 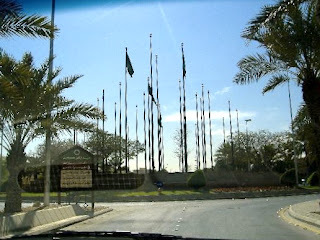 Dates in Saudi are calculated from the year Mohammed emigrated to Medina, known as the Hijrah. Each numbered year is given either an H for Hijrah or an AH for the Latin anno Hegirae (in the year of the Hijrah). Forget 2011. Yours truly is in 1432 AH, Islamically speaking. Musical events are a rarity in Riyadh. Just like art, there is an edict, or fatwah, against music. The nearest thing is the call to prayer. Non-religious music is banned because it may stir emotions, which might then encourage non-Islamic behaviours. 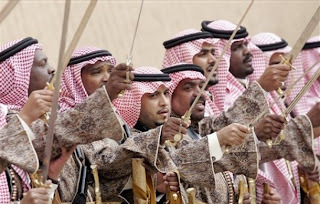 Saudis don’t dance either; I’m guessing for the same reasons. 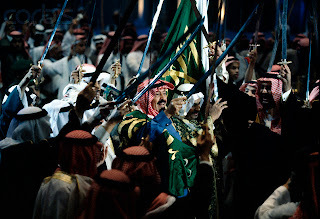 The king often welcomes overseas dignitaries with a traditional Saudi sword dance, but this is less a dance than a tediously slow shoulder-to-shoulder-shuffle with simultaneous swishing of swords through the air. Just a little of this clip will give you the idea…and yes, the swords are real. Occasionally small boys get to join in. But they don't have swords. They get to brandish miniature AK-47s instead. When concerts do happen, they’re sponsored by an embassy, take place in the Diplomatic Quarter and feature overseas artists. They’re not advertised. I found out about this recital through a friend who happened to be on the embassy mailing list. We faced stringent security entering the Diplomatic Quarter on Wednesday evening. Anti-tank barricades, soldiers with sub-machine guns, police cars flashing their lights, and armoured vehicles with big guns. Minutes later, entering the embassy, there was more of the same. We had to provide proof of ID and relinquish cell phones and cameras. And then just to make sure, there was a final zap with a metal detector. I wish I could say that I take all this in my stride by now, but it’s still disconcerting. Within the Diplomatic Quarter, you don’t have to wear your abaya. As soon as we reached the embassy, I threw mine in the back seat of our car with a great whoop of joy. When we got inside, I saw many had done the same - the audience was a sea of colour. The pianist began with some Saint-Saens, followed by Rameau, then Chopin’s E flat major nocturne. Unfortunately, just as the pianist began, so did someone else. Close by was an audible tuneless humming. When I conducted the school choir back in New Zealand, there were always a few children who sang enthusiastically – but very off key. We called them Enthusiastic Droners. And here, halfway across the world, was one right behind me. After the concert there was supper, wine and a chance to chat with others. This again is something that rarely happens in Riyadh because public gatherings are banned. Except for soccer matches - for the men. I went home with the music replaying in my mind. For a brief time, I felt, I’d been back in the real world. It's weird to think something as fundamental as music is so rare... do people walk round with iPods and that kind of thing? No, I have yet to see anyone walking around with an iPod. The sword dance looks just about like something someone with two left feet, like me, could manage. Step, step, swishy, swishy. Easy.